a little gray: Fabric & Good People Who Happen to Design It. So we got to visit the beautiful Whipstitch during our weekend in Atlanta. The place is very adorable, you should really check out Rachel's great pictures of it if you haven't yet. I realized that I hadn't ever visited another modern fabric shop besides the one I work in. While everyone else was hyperventilating over the fabrics they only get to order online most of the time, I was contemplating the layout of the store and trying to spy on the beginning class they had going on. (Not that I would need to spy, you know what I mean.) I was also learning up-selling techniques from the lovely girl who cut our fabric. Maybe it was just the Southern charm, but I feel like she could've convinced me to buy just about anything! Of course I did find some things we don't carry at Sewn to covet and bring home. 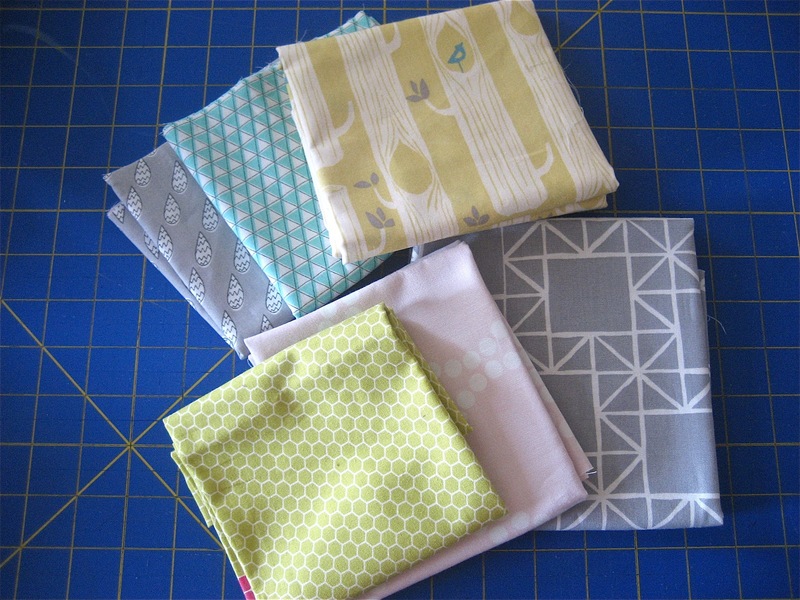 I got some Birch, Cloud 9 Monsterz, Quilt Blocks in a color way we don't have, and Lizzy House. I feel like there are at least a couple other fat quarters that didn't make it into this photo because they are strewn about my sewing room. I've already started a new quilt with some of these goodies! This Trefle print was a must for me. I think I remember Sophie using some in one of her awesome boy blazers? (Maybe Soph? Can't find it.) Anyway, mine will become a Nituna for Elsie in the fall. SO EXCITED. Sunday night was such a special treat. Four sewing celebs who live in the Atlanta area were gracious enough to join us for dinner. Deborah Moebes, author and the owner of Whipstitch, along with designers/ authors Rashida Coleman-Hale, Melody Miller, and Ellen Luckett Baker. And they didn't jet home to their families after dinner, which they totally would've been justified in doing, they hung around and chatted with us until after 10. We were even more floored that they each brought us gifts! Deborah had already given us the wonderful gift of 10% at Whipstitch. Rashida had signed copies of Zakka Style for all 8 of us, Ellen brought us fat quarters, and then Melody passed out a bag of Doritos to each of us. It was hilarious. Then she came back around with the typewriter fabric goodies, but the fact that she passed out Doritos first, sealed her place in my mind as the most adorable person ever. As you can see, I've been enjoying mine immensely. I love the Melody Miller panel...It sounds like you guys had fun! The Doritos...so funny! I used that trefle print in a baby dress: http://meagangracie.wordpress.com/2012/06/19/carousel-baby-dress/ and I have the purple that'll be going into the medallion of a quilt soon, I think. It really was awkward when you peed your pants. Geez, Jessica. So glad you had such a great time with everyone! Looks like you had so much fun! What a great trip. Sounds like an amazing trip and evening! OMG, I did say the stupidist thing to Melody Miller. I don't think I'll forget it... Hope she does! Love the Nituna pattern for Elsie, my adorably dressed by her mom the designer granddaughter.